If you’re a consumer-brand marketer, you’ve no doubt given thought to running a marketing campaign or having a presence on a mobile messaging app. After all, every consumer is increasingly using mobile messaging as their portal to mobile. It’s sticky and lends itself to repeat sessions, boasting the highest retention and engagement rates of other apps on average. So if you’re a brand who prioritizes community and brand loyalty, get in on the messaging game. I’ve identified two ways to use mobile messaging as a marketing tool. The first is to market on pure-play mobile messaging apps like WhatsApp, WeChat, and Snapchat . Pure-play messengers make up 6 out of 10 of the most-used apps globally, according to Mary Meeker. Keep in mind that this is relatively early days compared to, say, social media marketing, so we’re still evaluating, and we’re curious to see which methods are most effective as brands get more creative and tracking improves on mobile. Like social media, pure-play messenger apps have gigantic — nearly global — reach. WhatsApp boasts 700 million users, and has more than 80 percent penetration in Europe and parts of Latin America. KakaoTalk has 97 percent of Korea. Line is at 50-60 percent in Japan. WeChat in China has 500 million users. Snapchat has 100 million daily active users. For brands who want to connect directly with customers in an informal, intimate setting, this is a great way to do so at scale. But it comes with distinct downsides. Brands are at the mercy of pure-play messaging apps to deliver the features and tools that will capture and keep consumers in the long term — much like a brand depends on Facebook’s ability to keep users around. Pure-plays also can limit access to marketing tools. For example, WhatsApp’s Broadcast List feature limits each broadcast list to 256 users, causing extra overhead when a brand wants to reach users en masse. It may also be harder to leave a pure-play messenger than you think. When a brand invests time building an audience on one platform, then finds out that another pure-play messenger has better marketing features, they’d have to start over in order to switch. In-house chat refers to the addition of messaging features to a brand’s mobile app. The brand invites its audience to download its own app and chat on it, rather than on a third-party app like WhatsApp. This “owned” chat is relatively new as a marketing tool compared to pure-play messenger marketing — and certainly compared to social media marketing. A few leading brands have introduced chat features to their mobile apps, and we are starting to learn about the user response and how brands weave messaging into their marketing and sales efforts. What’s interesting about this is that you can use mobile messaging as more than a promotional tool: You can augment and change the nature of your brand’s product or service. You can make your core service higher-touch, you can use chat as a companion to improve your in-store experience, you can make other peers and fans part of the experience — and more. There’s also more potential to create long-standing relationships with fans. A user downloads the app to their phones, which is a high-commitment activity. Your relationship doesn’t end once the campaign ends, and push notifications let you draw users in again and again. Even better, their engagement might even be sustained by the connections and chats they exchange with other users, not just you. In-house chat leads to community building; not only do they connect with you, but superfans can connect with other superfans. Once you have a party going on your app, you can launch marketing campaigns with easier and more controlled execution. This allows for better targeting. In-house chat also allows for significantly better insights into key user behaviors, preferences, interest and sentiment. Here are some examples of how brands have used pure-play platforms and in-house chat to engage users. Brands like Procter & Gamble, Hellmann’s mayonnaise, Absolut Vodka and Toyota have tried their hand at WhatsApp-based marketing campaigns. Here’s a closer look at two campaigns on the platform. Toyota Spain built a fun “flirting competition” campaign on WhatsApp to drive the launch of its new car, the Toyota Aygo. According to Mobile Marketing Magazine, 99 percent of messenger app users on iOS in Spain have WhatsApp installed. 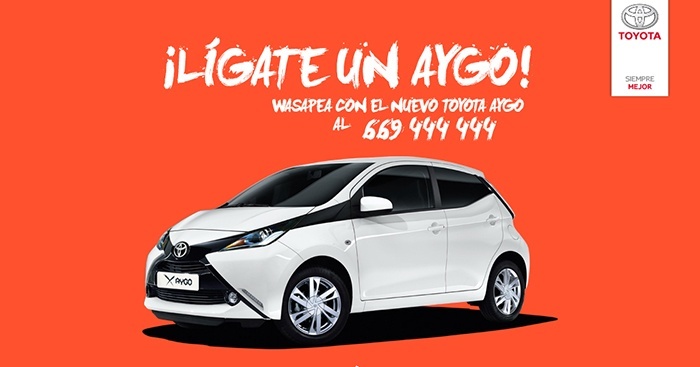 The campaign encouraged users to “woo” the new Toyota Aygo car (for a chance to win one of their own, with the winner announced on Valentine’s Day) by sending private messages to Toyota Spain with their best cheesy one-liners, memes, pictures, audio messages and videos. Toyota still had to rely on the reach they had on social media in order to drive traffic to the WhatsApp campaign in the first place. Potential fans heard about the campaign from Facebook and other promotions that gave them Toyota’s WhatsApp number. The Toyota campaign was one-to-one marketing in the sense that there was a direct line of communication between one user and Toyota, but multiple users could not interact with one another. What happens if chat gets more social? Israeli chocolate company Klik used WhatsApp to reach groups of teen friends. Friends could add Klik to their group chat and play a game of Klik Says together. Klik Says was like Simon Says, where Klik initiated the commands and friends sent back photos. Here’s a short video case study to see what the user engagement actually looked like. More than 2,000 teens added Klik to their WhatsApp chat, and 91 percent of them completed the Klik Says game. This high engagement rate on mobile messaging spilled over onto Facebook, with the Klik Facebook page engagement rates increasing by 51 percent. Snapchat has 100 million daily active users and 11 percent of U.S. teens say they use Snapchat more than Facebook. Consumer brands across industries have tapped Snapchat to reach teens. Ephemerality lets them send fleeting rewards and exclusive content, adding a ticking clock to drive up engagement. 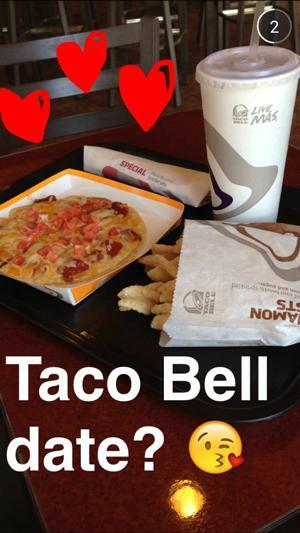 Taco Bell uses the app to announce new launches, promos and menu items. Nicholas Tran, former digital marketing lead at the company, says the users are “crazy engaged,” with 80 percent of users opening the brand’s snaps and 90 percent of them watching a sent video in its entirety, even if a clip is 5 minutes. Tressie Lieberman, now Vice President of Digital Innovation at Taco Bell, explains the rationale behind the approach: “It’s all about treating them like personal friends and not consumers.” Ms. Lieberman, we couldn’t agree more. Kik is a smaller, U.S.-based messaging platform for consumers that lets brands create chat bots. The Wall Street Journal calls it chatvertising. Funny or Die, which has a digital comedy group started by Will Ferrell and others, uses Kik’s paid Promoted Chats feature to send video clips to its contacts. They report that engagement is much higher on the chat platform than on social media, with a 10 percent open rate on Kik videos compared with 0.5 percent for posts on Facebook and Twitter. In addition to marketing programs, brands can directly monetize users through mobile messaging. In Asia, LINE is the No. 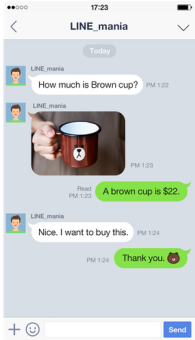 1 chat app in countries like Japan, Thailand and Taiwan, with roughly 200 million users; users can already pay for online and in-app purchases using LinePay. In February 2015, they launched the LINE@ app, which allows brands to connect with their fans and customers using one-to-one messaging and brand pages (like Facebook pages, but with more functionality). Brands can create their own branded announcement pages where they can post timely rich content, coupons, contests, polls and image-based messages with links. In addition, brands can leverage LINE’s payment services, mobile money transfer and mileage award programs. LINE also is pushing an online-to-offline strategy for physical retailers to get a new point of access. This is similar to the mobile store platform launched in September 2014 by WeChat, China’s dominant chat app with 500 million users. One platform to keep an eye on for monetization progress is Facebook Messenger, a messaging platform that offers massive user reach thanks to Facebook’s heavy push to get users to download the Facebook Messenger app on mobile. In April 2014, Facebook Messenger reached more than 800 million people. In the spring of 2015, Facebook built in customer service features for brands, similar to a WeChat or LINE@ customer service chat dialogue. Users would be able to get one-on-one customer support from a retail brand and ideally start to purchase items using the messaging platform. 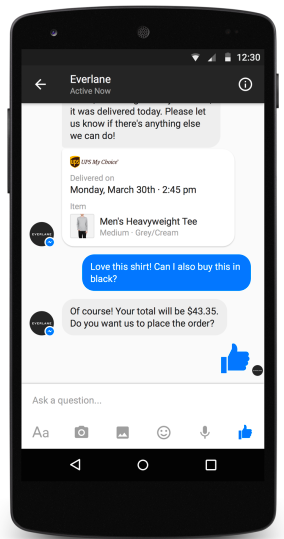 At its F8 developer conference, Facebook showed off Messenger’s integration with online retailers Everlane and Zulily. They can use Messenger services in their checkout flows to give customers updates on shipping, let them modify their orders or have them purchase another follow-on item. We’ll be watching this space to see how commerce on mobile messaging evolves on a U.S.-based platform. Teen-apparel brand American Eagle used chat to drive clothing sales directly and to solicit reviews for their products. This took place in their mobile app, which showcased their products and offered discounts. 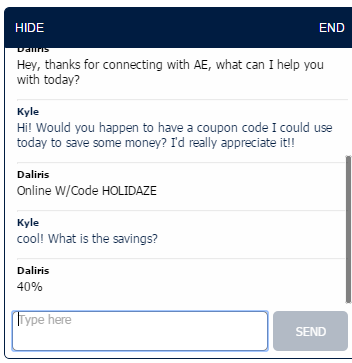 Users could tap into a live chat feature to talk to an American Eagle sales associate. The brand reports that teens asked the sales associates for shopping advice from sales associates and treated the experience as an informal styling session with a friend. The response to chat was overwhelmingly positive, and it had a business impact, as well: 51 percent of the conversations had to do with sales. American Eagle changed their service when they put chat into their app. Sure, they changed a small corner of it — it’s a huge chain and mobile sales are a fraction of in-person retail — but if it goes well, this experiment may lead to greater shifts in the way the brand operates and serves its customers. 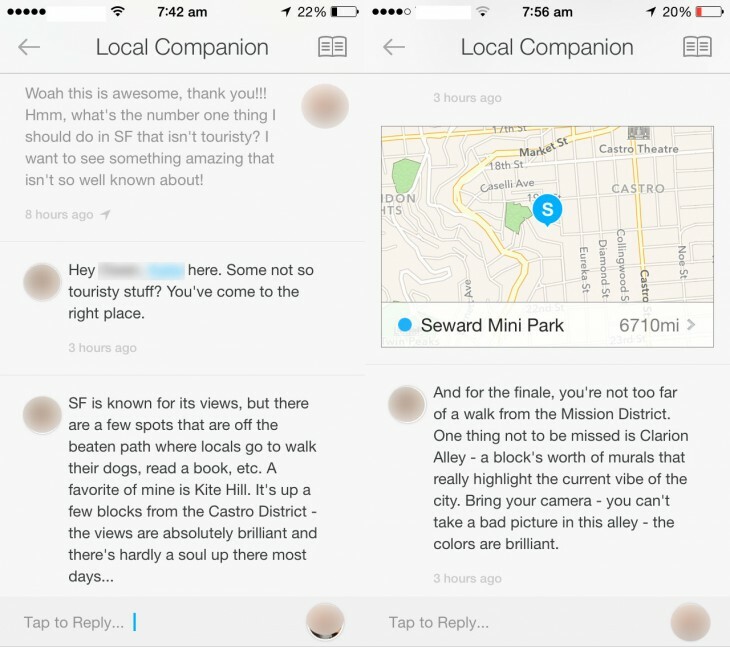 Airbnb smartly integrated in-app chat to offer a concierge messaging service called “Local Companion,” which is still in beta. This peer-to-peer chat gives Airbnb users great service and builds community. When an Airbnb customer books a stay in San Francisco, they can use Local Companion to chat with a person who lives in San Francisco and ask for personalized, instant travel recommendations. They might pass on a tip to check out Smitten ice cream in Hayes Valley. Not only does this peer-to-peer chat feature add value to the service, it changes the subjective feel of the Airbnb brand. The interaction lends a warm, personal connection and a sense of belonging. To get up close and personal with customers, improve quality of service and tighten their fan community, brands can introduce mobile messaging into their marketing mix. Brands can run a test marketing campaign on a popular messaging app or commit to mobile messaging all the way by creating a dedicated, branded mobile app with chat capabilities. Either way, this is a space to watch.